Inside APS’s recent article, ‘April is Valley Bike Month,’ generated comments from three regular bike commuters who say the benefits they get from biking to work extend well beyond April. Senior Marketing Coordinator Charlene Saltz bikes four miles to APS headquarters several times a week from the near west side. Biking to work is not without its challenges, though, and each of these riders has had to find ways to overcome them. They have to deal with their personal safety on the road, the security of their bike while they’re at work, and one of the biggest challenges in this hot climate is finding a place to shower and change once they arrive. Bike theft is a problem in Phoenix just like any big city, and bike commuters are often concerned for their bikes and accessories while they’re parked during the workday. Stephan, pictured at left, says he’s had good luck parking at the bike racks in the Arizona Center’s garage at APS headquarters. But he adds that he rides his ‘junker’ bike instead of his expensive racing bike when he commutes downtown. 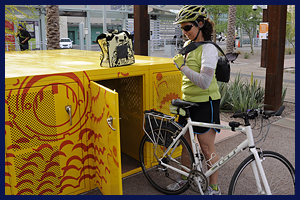 Saltz uses the fully enclosed yellow bike lockers available at the Central Bus Station at Van Buren and Central, just a four block walk from the headquarters. The lockers are free, and riders secure them with their own locks. Maricopa County is talking with the Tempe-based Bicycle Cellar about opening a downtown facility that would provide bike commuters with inside bike lockers and a place to change and shower – plus a full service bike shop. Ed Fox, vice president and chief sustainability officer, has said if that facility is completed, APS will help subsidize the cost of using it for employees who commute to work by bike. 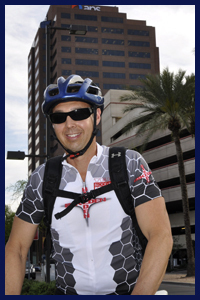 Track your bike commutes and qualify for special APS prize drawings for Bike Month. 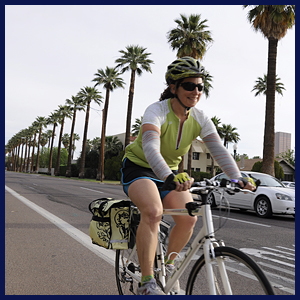 Questions about Valley Bike Month or any of APS’ Trip Reduction Program activities can be directed to Trip Reduction Coordinator Vicki Olsen, at 81-3241. Information is also available on the APS Trip Reduction website. Under a 15-month contract with APS, I wrote for the company’s daily intranet news publication, Inside APS, and served as an internal communications consultant for a variety of APS departments. The purpose of this intranet article was to raise awareness and promote employee dialogue about alternate forms of commuting. I recruited and interviewed three employees who regularly bike to work, and shot pictures of them during their commutes. NOTE: Links to material behind APS’ firewall have been disabled.